An Occlusal Guard (Night Guard) is a horseshoe shaped piece of plastic which is worn over the teeth to protect them against damage caused by teeth clenching and grinding. It works by creating a physical barrier between your upper and lower teeth so that you bite against the plastic rather than wearing down your teeth. Most people are unaware that they grind (also called bruxism) or clench their teeth as it usually happens when they are sleeping. It is often a person's partner, or dentist, who first notices that they are grinding their teeth. People tend to go through phases of grinding their teeth, such as during times of stress. It is during these times that you may need to wear a night guard to prevent doing permanent damage to your teeth. 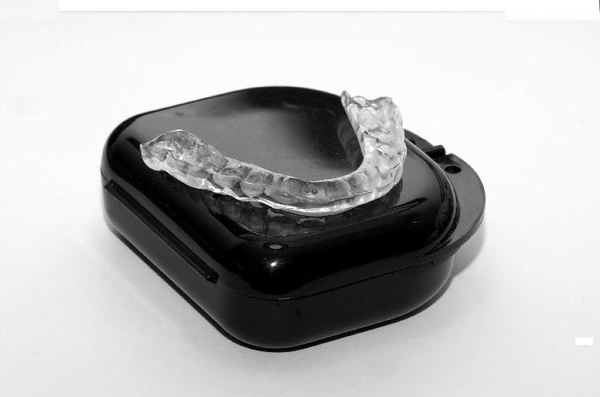 When should I wear my Occlusal Guard? Occlusal Guards are usually worn at night (Hence they are usually referred to as Night Guards) when people are not able to stop themselves from grinding or clenching their teeth. If you are a severe grinder, your dentist may also recommend that you wear it during the day, but this is not usually required. In our society, stress is always present, to the point where we aren't even aware that we are under stress, therefore it is recommended to wear nightly. What is an Occlusal Guard made of? An Occlusal Guard is made of clear hard acrylic. Your Occlusal Guard may become cloudy and discolor over time, but this does not affect functionality of the guard. Occlusal Guards can be made for either the upper or lower teeth, but usually for the upper teeth as they are more comfortable. How long does an Occlusal Guard last? How long your night guard will last all depends on the severity of your teeth grinding. Typically, they will last between 5 and 10 years, depending on stress levels. While wearing the Occlusal Guard, you will continue to clench, but the wear will be on the guard and not on your teeth.If you haven't worn your Occlusal Guard for a while, your teeth may have shifted and the guard may fit very tightly or not at all. Many times, a visit to your dentist for adjustment will be necessary to fix this problem. When wearing your Occlusal Guard do not eat or drink anything other than water as this may discolor it. After removing your Occlusal Guard in the morning, brush it with your toothbrush and toothpaste and rinse with cold water. Also, never rinse your Occlusal Guard with hot water as this can distort the shape and cause it to no longer fit. When not in use, place in your night guard container and let it air dry. The Occlusal Guard cost will of course vary greatly from dentist to dentist. It can be an extremely worthwhile investment in the long run. It may prevent you from needing more expensive dental work in the future, such as broken fillings, cracked teeth (crowns), and periodontal problems (bone loss). This is why we recommend that our patients invest in a guard to protect their teeth.